You never know when a road emergency may strike. So you'll appreciate this sleek, compact jump starter that lets you power up your car without leaving the driver's seat. 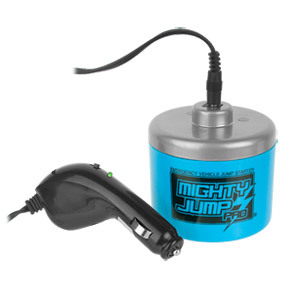 When the Mighty Jump is plugged into the dashboard cigarette lighter, it transfers power to the car battery, using the internal wiring of the vehicle. That's peace of mind that's ready at the jump. If your battery is dead, don't struggle with jumper cables. In fact, don't even get out of the car when you use the Viatek Mighty Jump PRO Emergency Vehicle Jump Starter. This emergency jump starter charges your car's battery by plugging into a standard 12V outlet! Simply plug in the jump starter - 10 minutes is all you need to charge your car's battery enough to start the engine. When you're all done, simply store the jump starter in your glove box, cupholder, and more. The jump starter is designed for 4, 6, or 8 cylinder gas powered cars, light trucks, and SUVs.